Monday and Tuesday in NYC I was on my own, so I wasn’t really sure what to do! After several days of intense food-ing I needed a bit of a breather, so I just snacked a bit for breakfast in the hotel before heading over to the Tenement Museum. From the magic of Twitter I found out that Jennie the Potter was also in town, and also headed to the Tenement Museum! My tour actually wasn’t until the afternoon, but I headed over anyway to say hi – the museum was super close to the hotel. Yes, a lot of things were super close to the hotel, which was awesome. I bought my ticket for the “Piecing it Together” tour, which focused on several families of garment makers that lived in the tenement. For those not familiar with the museum (I hadn’t heard of it before I started planning my trip), the museum is a tenement building on Orchard St that was built in 1863, and occupied until the 1930’s when it was condemned by the city and boarded up. The museum was founded in the late 80’s, and consists of apartments in various states of recovery and restoration. I couldn’t take photos inside, but it was super interesting and definitely worth checking out if you’re in the area! The museum’s about page has lots of great info, and there are photos and stories on their website as well. After the tour I bought a copy of 97 Orchard, which I’m excited to read! Since the tour actually wasn’t until later in the day, after I said hi to Jennie I decided to do a bit of shopping. I hit up All Saints, Anthropologie and Purl Soho and got some great clothes and some Shelter yarn. Purl was really lovely, sadly I had a bit of camnesia and didn’t take any photos! 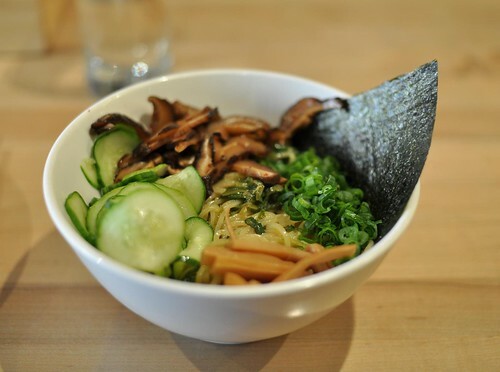 After the tenement tour and dropping off my purchases at the hotel, I went to Momofuku Noodle Bar for a late lunch – the ginger scallion noodles are veg, and really hit the spot. 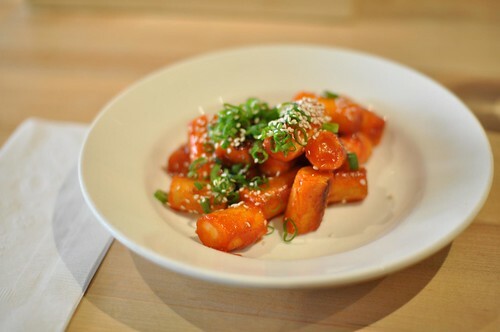 I loved the roasted rice cakes as well, and I’m hoping to try my hand at a similar dish here at home. I decided to check out Habu since everyone said it shouldn’t be missed – I didn’t take any photos, and I didn’t buy anything, but it was really interesting to see all the yarns. It’s such a funny space in an office building, almost feels just like someone’s stash or something. I went to the Avril/Habu store in Tokyo when I was there a few years ago, so it was nice to check out their yarns in person again. Amidst my wanderings I ended up outside the Rockefeller centre, and though I hadn’t been planning on it, went up to the observation deck (Top of the Rock). It was just after sunset, so it was quite cold and windy but the city lights were lovely. I ended the night by grabbing take out from S’mac (macaroni and cheese! mine had broccoli and cauliflower in it) and turning in early. Tuesday was my last day in the city, so I decided I would check out a museum or two before I had to head to the airport in the late afternoon. I went to the MOMA only to find out they were closed on Tuesdays! Way to research, self. There were plenty of other people milling around outside who’d clearly made the same mistake, so I didn’t feel too bad. I guess it’s like the Louvre. 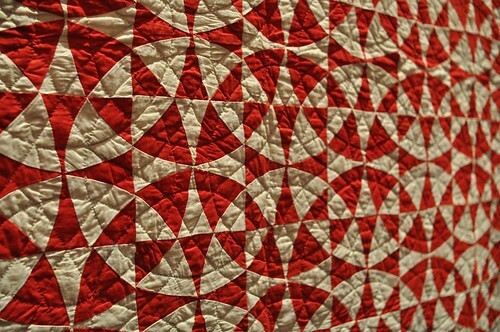 Instead, I went next door to the American Folk Art Museum and looked around there – they have two floors of quilts amongst other exhibitions, and they were lovely to look at. 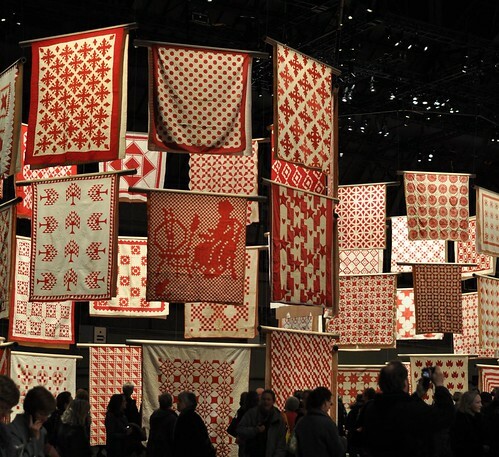 I’m glad everything ended up the way it did, because by going to the Folk Art Museum I was reminded about the Infinite Variety quilt exhibition that was going on over the weekend, put on by the museum at the Park Avenue Armory. I hustled over on the subway to see it, and I can’t even tell you how glad I was that I made it there! 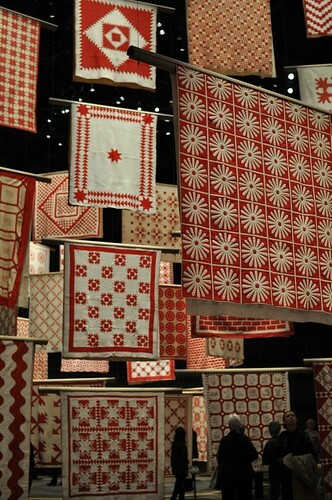 On display were 650 red and white quilts collected by Joanna S. Rose, hung as if suspended in midair. I can’t really describe how incredibly awesome, gorgeous, and humbling this was. It was spectacular. I just don’t know what else to say about it! Every time you looked, there was something different that you had missed, some amazing shape or texture or entire quilt you hadn’t noticed before. There were lots of people there, and you could just feel the amazement of the whole crowd. 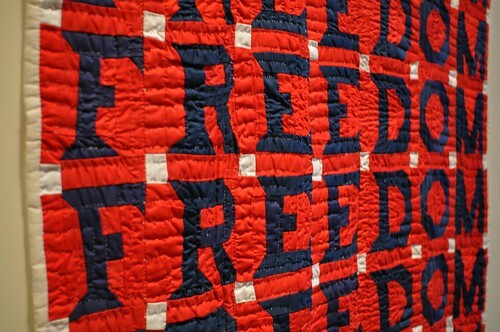 There’s so much history, so many stories in these everyday quilts. I would say it was one of the most inspiring and beautiful things I’ve ever seen. I made this panorama out of several photos stitched together in Photoshop. I know it’s small here because it’s so much wider than it is tall, but I hope it gives you a bit of a sense of the layout – this was only half of the room! If you want to see it bigger, click here! This version is 2000 px wide, and I hope it helps you imagine what it was like to be there. I can’t wait for the catalogue to come out, because I’ll be picking it up for sure. For my last meal in NYC I went to Motorino again and had the lunch special, a salad and and a margherita pizza. It was delicious. And then despite some mishaps with NJ transit, I got to the airport early enough that the airline put me on an earlier flight home and I got home 2 hours early. 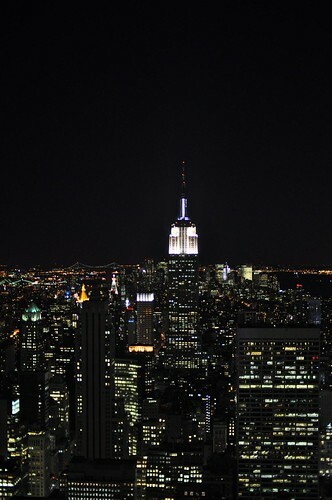 And that was my trip to New York! I had so much fun. I can’t wait to go again…maybe in the summer! Looks like you had a great time in our fair city! I can’t wait to get to the quilt show. Your photos make me want to go right now! 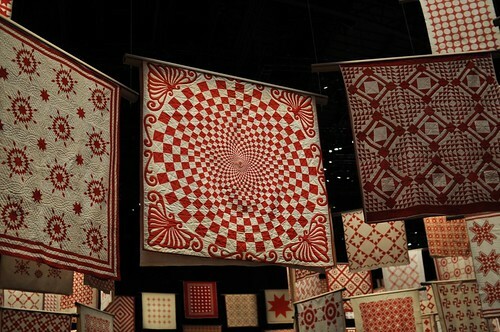 Someone else had posted photos of that quilt show, and every time I see photos, it reminds me of the backs of playing cards, flying around in the air. It’s pretty cool, and I’m sorry I won’t get the chance to see it in person. Those quilts are mind-blowing! 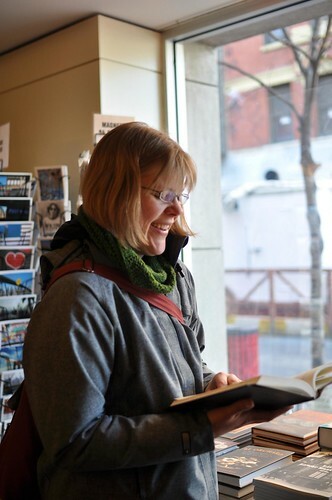 Thanks for the pictures–they really give a good sense of the *feel* of the exhibit! I can’t believe I’ve never been to NYC… It’s been fun to read about your stay there and see all these wonderful plates of food! Thanks so much for posting this – I’m planning a trip to NYC for this summer, so I really appreciate all your notes! 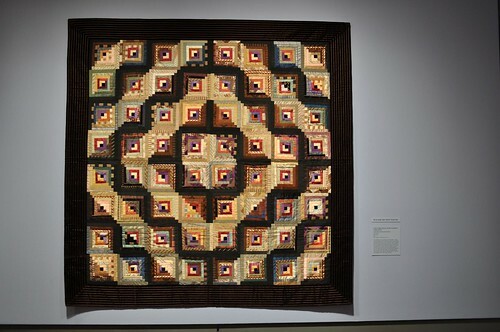 Oh wow – those quilts are amazing, and the way they are hung is inspired. Thanks for sharing these photos! Aren’t the best vacations full of unexpected discoveries? New York is full of them, every time. I love Toronto too!